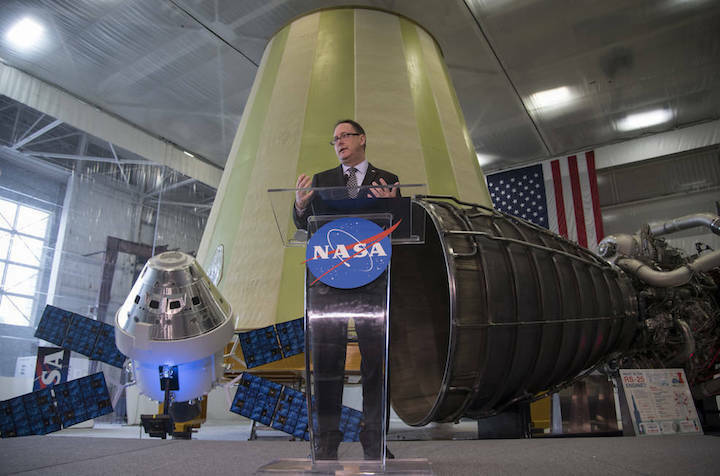 Acting NASA Administrator Robert Lightfoot discusses the fiscal year 2019 budget proposal during a State of NASA address Monday, Feb. 12, 2018 at NASA's Marshall Space Flight Center in Huntsville, Alabama. “It is my privilege today to present President Trump’s Fiscal Year 2019 budget request of $19.9 billion for NASA. It reflects the administration’s confidence that through NASA leadership, America will lead the way back to the Moon and take the next giant leap from where we made that first small step nearly 50 years ago. “This budget focuses NASA on its core exploration mission and reinforces the many ways that we return value to the U.S. through knowledge and discoveries, strengthening our economy and security, deepening partnerships with other nations, providing solutions to tough problems, and inspiring the next generation. It places NASA and the U.S. once again at the forefront of leading a global effort to advance humanity’s future in space, and draws on our nation’s great industrial base and capacity for innovation and exploration.